Elliott Seabrooke (1886-1955) - painter, especially of landscape, and actor, born in Upton Park, Essex (his adopted name combined that of his father, Robert Elliott with his mother's, Harriet Seabrooke). Seabrooke studied at Slade School of Fine Art, 1906-11, with Henry Tonks then took a remote shed in Westmorland for £2 a year as a studio, putting in his own windows, door and chimney. In World War I Seabrooke - a pacifist - served in the British Red Cross, won Italy's highest award for gallantry and was an Official War Artist on the Italian front. He was tall and handsome, with a fine singing voice, which led to a thespian career. He did much work with the directors Theodore Komisarjevsky and J B Fagan, and acted with John Gielgud, Lewis Casson, Sybil Thorndike, Wendy Hiller, Charles Laughton and Ralph Richardson. Also appeared in films, including Gabriel Pascal's Major Barbara, 1941, but preferred the stage, which left the day free for painting. 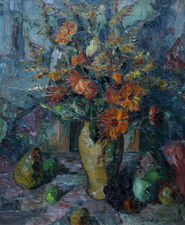 He showed at NEAC, LG of which he was vice-president and president during most of the 1940s, having had a first solo show at Carfax Gallery, 1912. Seabrooke was much influenced initially by Cézanne in both style and palette, Italian Futurism and Pointillism being later influences. He travelled widely in England and on the continent for landscape subjects, after 1930 living often in the Netherlands. He died in Nice and had memorial shows at Leicester Galleries, 1951; Arts Council 1952; 1955 at Matthiesen Gallery; and in 1966 at Upper Grosvenor Galleries. There was a show at Blond Fine Art in 1979. Tate Gallery, Imperial War Museum and Arts Council hold example.